SANFORD - The Central Carolina Community College Board of Trustees has honored Susan Laudate for her service as a member of the board. Laudate served on the board for four years, from 2011-2015. Mrs. Laudate was saluted during the board's retreat on Sept. 17. "Susan, it was always a pleasure to work with you," said CCCC President Dr. T.E. Marchant, noting that Mrs. Laudate always had the student interest at heart. "There was no greater advocate of the students of Central Carolina Community College than Susan Laudate. "Susan, as president of the college, it was an absolute honor and privilege to serve with you as you helped guide this institution. Thank you very much." Julian Philpott, Chairman of the CCCC Board of Trustees, said that Mrs. Laudate served faithfully. "She was at every meeting, and was a strong contributor in the committee process and the board process. When she had something to say, we all listened to her because we knew it was coming from her heart and it was well thought out," said Philpott. "Susan, we appreciate all the service that you provided to Central Carolina Community College," said Philpott. "We all appreciate all the efforts you've put in to making Central Carolina Community College the best place it can possibly be for a quality educational experience. For that, we're very grateful to you and thank you for your service." Mrs. Laudate thanked the Trustees, adding that when she came to Lee County 30 years ago she taught English in the CCCC Evening College. "When I had the opportunity to come back and serve, it was really an honor and a treat to see it from the administrative side," said Mrs. Laudate. "I'm really proud of all we have done and all that you will continue to do, and I certainly will continue to support in whatever way I can." 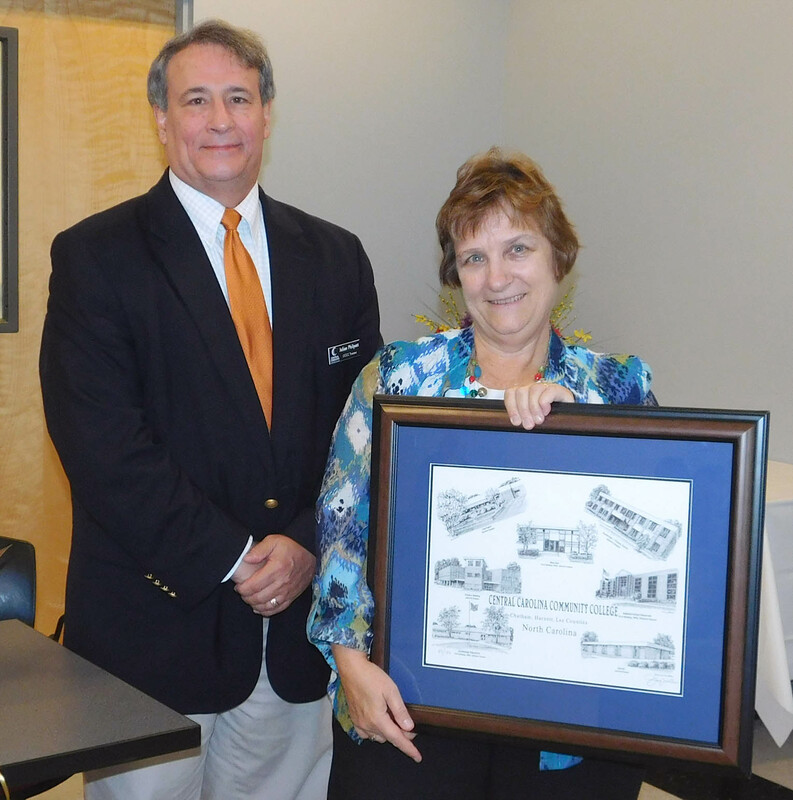 Susan Laudate (right) holds the Central Carolina Community College print that she received for her service as a CCCC Trustee. Standing with Laudate is Julian Philpott, Chairman of the CCCC Board of Trustees.